Have you ever noticed how noisy nature is? 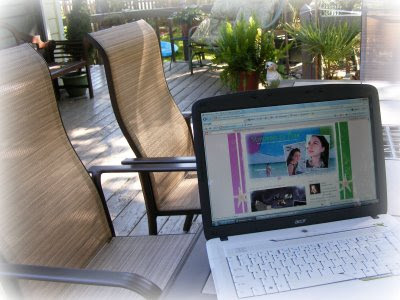 I decided to sit on my deck to blog this morning. And it hit me. The loud song of the cicada. The tall trees that tower around me seem to be nature's own speakers as the concerto blasts through the air. At times, the symphony can seem deafening as the song rises into a crescendo. Afterwards, it begins to fall into a summertime lull until the next crescendo takes over. If I need a few facts to back up my claim, consider this: the song of a singing cicada can actually register at over 100 decibels. But, get this... male cicadas are not loners. Instead, hundreds and thousands of the males gather together to sing, fly, and ultimately land on sunny branches as they court females through song. The cicada songs aren't the only sounds of summer. As day turns into evening, frogs join in the medley, and owls make guest appearances swooping from the trees with their lonesome "woos" seeming to echo in the distance. Wish I were sitting on the porch with you. It's such a nice porch. Caitlin noticed the same thing yesterday when we leaving for dance lessons. She commented on how loud the cicada were in the tree in the next yard. oh I love the songs of nature, even those noisy cicadas. great post. I love the sound of nature. I wish I was better at taking my reading, writing etc. outside. I love that you sent your writings into adult magazines!!! I was always making stuff up on my parent's old typewriter too. So funny!!! I don't mind the sound of cicadas either, unless I am trying to get to sleep while camping. The thing I don't like about cicadas is "cicada rain" when you walk under a tree that is supporting all those male cicadas! YUCK! Lion told me the other day that he wanted to be a cricket. I told him they are noisy bugs that creep into the house and hide just so they can annoy me late at night. He said he would be a good cricket that would only make noise during the day and sleep at night. I let him know that if I catch him in the garage at night like the other crickets I'll stomp on him too. He was not so impressed with his mothers love of nature. Oh, Roban. I am so very glad you've found me so that I can come and "meet" you, too. What a lovely space you've created. I love your porch, it is beautiful and a perfect place to listen to a concert! Harry, Ron, Hermoine... I'm Glad to See You Back!